There are some natural ways to get rid of baggy eyes. Eye bags are often called panda eyes. Baggy eyes, dark circles, wrinkles under the eyes, or eye drops, a sign that the skin is experiencing the aging process. Therefore, do not wonder if someone could look older than her actual age because of this problem. Eye bags characterized with the skin under the eyes are down, thus forming a pouch. Eye bags generally do occur to those who are advanced age. However, it could have happened at an earlier age, which is around the 20's. When the eye bags appear at the age of 20, eye bags are easily reduced, because the skin is still very good. Whereas when eye bags appear in thirties or even forties eye bags is permanent, although it is not always like that. Eye bags are usually experienced by those who frequently lack sleep or staying up late, often working in front of computers, lack of drinking water and who work more than eight hours a day. Stress, genetics, and age factor can also cause eye bags. Try as much as possible to obtain enough rest. Although the lack of rest or lack of sleep can cause eye bags, but the excess hours of sleep is also not justified. Excess sleep can also make eyes puffy and unhealthy. Therefore, the most appropriate way is a set bedtime for balance and moderation. Excessive stress can also cause baggy eyes. Therefore, for any problems that we are facing, you should not worry about it, because it would interfere with our appearance, especially the face. Preferably before bed we use eye creams that we apply in the area around the eyes to maintain skin elasticity. The earlier you use an eye cream that will better the results. It will help eliminate the 'panda eyes' caused by lack of sleep from staying up or can not sleep at night. This method is very powerful relaxes eye muscles are kept open all day. The trick, dip a cloth in cold water and kompreskan in both eyes. Do about 10 minutes, before we went to bed. 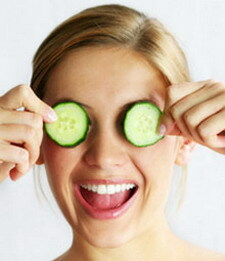 Cucumber most widely used to treat dark eye circles (panda eyes). Get used to put cold cucumber slices to your eyes 2-3 times a week. Allow 10-15 minutes. That way, the dark circles around your eyes will be reduced. Just like cucumbers, potatoes can also help to overcome the darkness of the area under the eyes. The way is easy, with a thin slice of raw potato on your eyes. Then leave it on for 10-15 minutes. Many other liquids are used to reduce the effects of dark circles under the eyes, one of them by soaking the cotton in cold rose water then put in the eye. Perform a sitting position and relax for 10 minutes. Tea bag extract is also a good way to reduce eye puffiness. Only by placing a warm tea bag extract and let stand for 15 minutes. After that, you will look fresh. But remember, make sure the bag of tea extracts was really warm and not hot conditions. In addition to preventing dehydration, drinking water can also help prevent the effects of dark circles caused your eyelids dry skin. It's easy, make it a habit to drink 8-10 glasses of mineral water a day. Drinking enough water will help keep the supply of water in your skin.